The Associated Press journalists who won the Pulitzer Prizefor breaking news photography come from vastly different backgrounds, but are united in their mission to document the civil war in Syria openly, fairly and accurately. 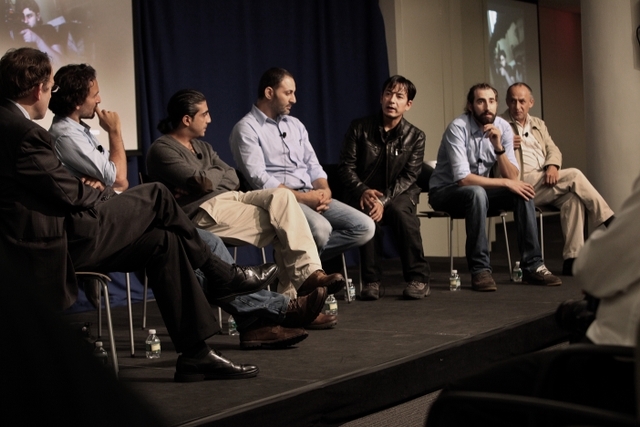 The team of Rodrigo Abd, Manu Brabo, Narciso Contreras,Khalil Hamra and Muhammed Muheisen spoke candidly about their experiences, living conditions and the backstory of some of their powerful images at a panel discussion for staff at AP headquarters in New York ahead of the Pulitzer ceremony on May 30. They were joined by Middle East Regional Photo Editor Manoocher Deghati and AP Vice President and Director of Photography Santiago Lyon. Abd, who is based in Lima, Peru, but is of Syrian descent, said “going back to his roots” to cover this story was sad, but important. “We don’t do this for awards. We believe in journalism and the impact we can have with pictures,” he said. See a slideshow of winning images. From left, Santiago Lyon, Rodrigo Abd, Muhammed Muheisen, Khalil Hamra, Narciso Contreras, Manu Brabo and Manoocher Deghati.